In South Africa the first of January is when most people especially Africans head to the beach. I do not know where this custom came from, but it is a fact mentioned often even as far up the coast as East London. 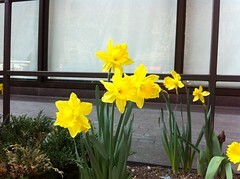 Today I decided to investigate this phenomenon myself and walked towards the promenade with Robert. 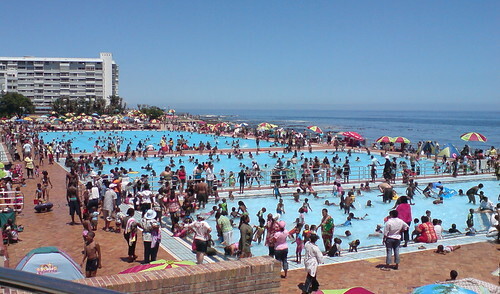 The first thing we saw was a very long queue in front of Sea Point swimming pool, then we witnessed the crowds that were already enjoying a swim there. 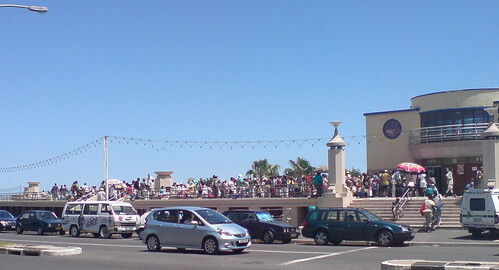 Of course there were many more people occupying the shaded area on the promenade. For the occasion the city council prepared extra portable loos to relieve the pressure on the existing washrooms. So I was dismayed when I actually had to visit a washroom to attend to my son’s nappy (I was prepared to change the nappy anywhere but I had a hard time finding a private space on the grass amongst the picnicking masses). To my surprise, or perhaps because it wasn’t noon yet, the washrooms were not busy and still fairly clean. I was able to change Robert quickly and there was even toilet paper to complete the cleaning task. For his part, Robert did not like lying on the hard bench in the changing room, he howled inconsolably while staring at the mouldy ceiling and the broken fluorescent lamp. Maybe the place was not up to his standards, he is part snob of course. I was not planning to stay the whole day at the beach. Today I wanted peace and quiet, away from the crowds; this was the last day of my holiday and tomorrow I have to start working again. I headed with Robert towards Mount Nelson Park, which is always quiet on public holidays. Today we had it to ourselves. Robert slept in his buggy for over an hour and I relaxed and read my book. When Robert woke up he got to enjoy playing on the swing, running around and looking for sticks (tick). It was a great way to start the year. We returned via Main Road, Sea Point which was bustling with people, so different from the quiet deserted streets on Christmas Day. Stores and most businesses were open, and people were just in full party mode. More people were still streaming to the beach, and there was still a long queue to the swimming pool. For Robert and me though it was home time, we had to get ready for a long day tomorrow. 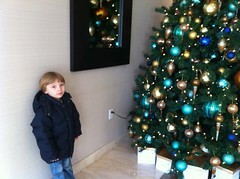 This entry was posted in Life and Social and tagged Beach, CapeTown, Holiday, Park, Sea Point, Swimming Pool. Bookmark the permalink.